The Optragate (by Ivoclar) is a nifty disposable item that effectively retracts lips and cheeks exposing both dental arches for easy access. I use it mostly when performing restorative treatment on multiple anterior teeth. With the Optragate in place, I have unfettered access and visibility of the teeth. It also helps the patient relax, as it holds the mouth open without any effort. Today I had a patient in for eight upper extractions and an immediate denture. My assistant asked if I wanted to use the Optragate. Honestly, I hadn’t thought about it. But, it sounded like a great idea, and it was! With the Optragate inserted, I had a perfect view and access. All eight extractions were done much more easily without having to simultaneously retract numb lips and cheeks. But, even better was the suturing! Suturing without having to retract was SO much easier! Ask your supply rep about the Optragate (Ivoclar Vivadent). Get a box and try’em out! It’s that third and fourth arm you wish your assistant had! 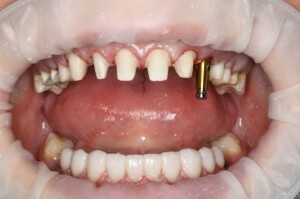 This entry was posted in Clinical Technique, Dental Product Reviews, Tips & Tricks and tagged Optragate. Bookmark the permalink. Optragate and Isolite make my life so much easier! Totally agree. This is one of THE most helpful isolation peripherals we use besides the isolite. Using them simultaneously is unreal. We use the optragate for in-office bleaching, restorative, scaling and root planing, multiple crown preps and impressions, and more. My assistant loves it when she goes to make her temporary crowns, too. I’ve got a box of them that I haven’t used. I want to love them. I’m a huge fan of the dam and have no problem getting a dam on. But for whatever reason, I can’t seem to get an Optragate to hold in place with any kind of stability. It’s almost like I can’t get it inside the patient’s lips enough? Any tips? Perhaps a video of placement? I’ll try them again, for sure. I just wonder if you’d give me some guidance. Try taking a full arch impression with it in place. Piece-0-cake!! Also get both sizes: small and regular. For most women, the small seems to fit better. Optragate certainly made my life easier. I use it for prophy cleaning, fluoridation, prepraration also impressions.